Alaskan Malamute Dogs - The Alaskan Malamute is a large northern dog breed originally bred for use as an Alaskan sled dog. This information is licensed under the GNU Free Documentation License. It uses material from the Alaskan Malamute article on Wikipedia.org. 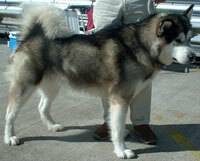 Alaskan Malamute Breeders - Advertise your kennel puppies and dogs here. Cascade Kennel - Washington - Twenty six years experience. Strong - Swift and stunning. Working dogs, excellent and superior titles. Home of National pulling champions. IWPA - AMCA - Puppies available occasionally out of selective breeding. Hudsons Huskies and Malamutes - Tennessee - AKC registered Alaskan Malamutes and Siberian Husky pups. Shipping is avaliable.